•Upon receiving the item,it's recommended to fully charge the unit before using it. •Charge battery at least once every 3 months to preserve lifespan. •Press the on/off button then hold for over 3 seconds to turn on the flashlight. A powerful compact and convenient one of a kind charge-everything device that fits inside your pocket or glove compartment of your vehicle. Never worry about your smart phone or tablet running low on battery ever again. If your car won't start, you don't have to call a tow truck service for assistance. If you enjoy the outdoors you don't need to bring an additional flashlight. The Nekteck Car jumper is the only thing you need to solve all of these problems. It's the swiss army knives of portable battery devices. It can power and charge all of your devices, start your car,and save your life. •Don't crank the engine for more than 4 seconds. Allow the jumpstarter to cool down for at least 30 seconds after each jump-start. 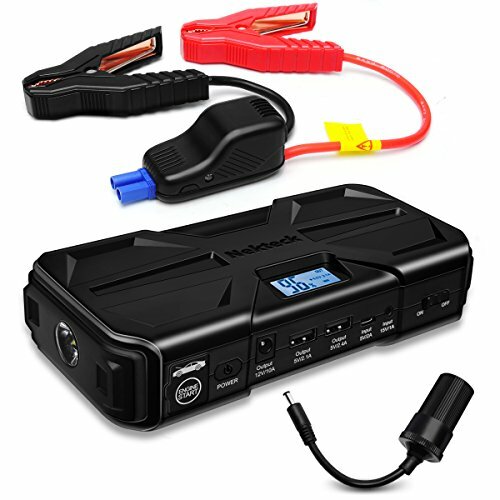 【Best Battery Capacity】Real 20000mAh high battery capacity ,800-amps of power jump starts all gas or 5.5L diesel cars, motorcycles, ATVs, lawn mowers, tractors, and more up to 20 times to get you back on the road fast. 【7 in 1 Multi-Functional】This Car Jump Starter have Multi-Functional with Car Jump Starter + SUPPORT Mirco USB input port FOR recharge it +12V DC Output+ Portable Outdoor Charger + LED light + SOS Emergency Flashlight + Dual USB Charger Port,Which meet most of your daily requirement. 【Dual quick Charging Output】Two USB quickly charging ports support 5V/2.1A and 5V2.4A, allowing you to recharge your mobile phones, tablets, kindles and other devices faster. 【Compact & Powerful】The compact powerhouse is small enough with a portable carrying bag for your easy carrying and rather powerful for 20000mAh/74Wh capacity. 【Safety & Protection】It will safety protect your devices for overcharge, overvoltage, overcurrent, short-circuit, Which is A must have for every car!